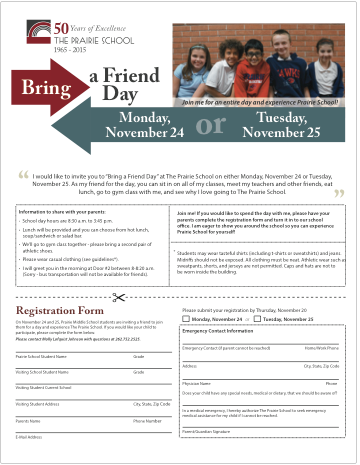 On Monday, November 24 and Tuesday, November 25, Prairie Middle School students are encouraged to invite a friend to join them for a day and experience all that The Prairie School has to offer. Visitors will spend the entire day with their host student and sit in on classes, enjoy a free lunch, participate in gym class and more. Interested families should download the invitation below as well as contact the Admissions Office with questions (262.752.2525 / [email protected]). This entry was posted in All News, Middle School by Communications Department. Bookmark the permalink.